Trevalgas Cottages offer five properties on a small complex (of 14) with heated indoor pool, games room, on-site laundry, open play areas, etc on the outskirts of the village of Poughill, and set in rolling countryside. Under 1.5 miles from Bude town centre, with its glorious beaches and rugged cliffs. We use the phrases “Peace without isolation” and “Escape to tranquility” – and you need to experience it to appreciate it! The five cottages at Trevalgas are Blackberry (sleeps 4), Bramblewood (sleeps 6), Briar Patch (sleeps 6). Chestnut (sleeps 6) and Linhay (sleeps 4). All are comfortable and well equipped. Some accept dogs, others are kept pet free. Trevalgas Cottages offer five units, priced from £320 per week. Trevalgas provides a superb 40ft (or 12.3m) heated swimming pool, with male and female changing rooms and a hot shower. Open daily all year round. The pool is free to use. It has a constant depth of 4ft (or 1.27m) and is very popular with young families. The pool is for the exclusive use of guests in the self-catering cottages at Trevalgas, so it’s hardly ever crowded. Indeed, many visitors have arrived as non-swimmers, and have left Trevalgas as competent swimmers! The pool will normally be open at 7.45am to allow for a swim before breakfast, closing at 9.00pm (July 5th – Aug 26th), 8pm (May 24th – July 4th) or 7pm for the remainder of the year. With such long opening hours, you can enjoy a swim every day of your stay, and whenever it suits you. Trevalgas has its own on-site outdoor play area with adventure playground and recreation field. This area is suitable for all ages, and the recreation field is perfect for kicking a ball around with the kids. The children’s adventure playground includes a Wendy House which children love to transform into a shop, home or even a theatre. This area is designed to keep your children happy and occupied while the older children walk the wobbly plank! 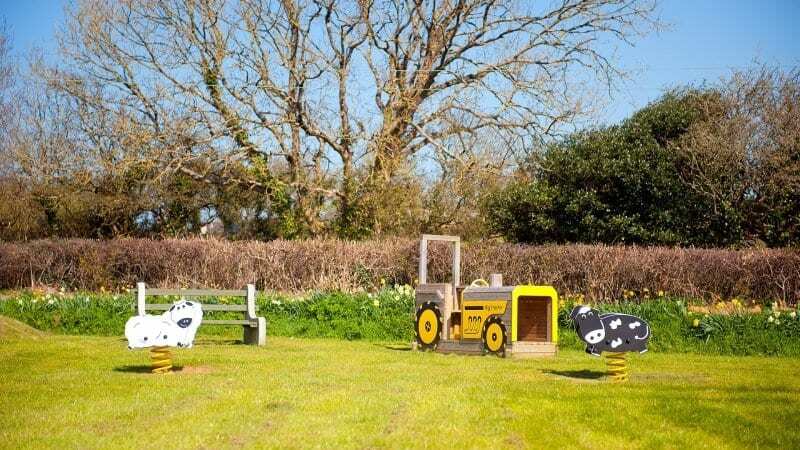 For the younger children, we have some farm-themed play equipment with springy animals to ride, and a large crawl-through tractor. And there are a couple of south-facing benches, ideal for relaxing, while keeping an eye on the children. There is a small orchard, offering a peaceful and shady retreat. Some families bring a blanket, a book and refreshments to this area. Perfect. Access to the outdoor play area is from the car park side of the leisure building. However, occupants of Bramblewood, Blackberry, Briar Patch and Linhay have direct entry from their gardens to the recreation area. The Games Room has table tennis and pool tables (40p per game). (The table tennis bats and balls are provided and stored in each of the holiday cottages.) The cupboard in the Games Room contains plenty of books and board games for guests to borrow. Three automatic washing machines, detergent dispenser and a couple of laundry baskets along with three large capacity tumble dryers. Note: there is a modest charge for using these machines. All cottages have irons and ironing boards and their own clothes line. Since 2006 we have offered free Wireless Internet Access (Wi-Fi) in all cottages. There is excellent broadband reception over the site so you can use it in the cottages, in the gardens, the car park, or in the leisure building,.